Tina Ceja loves music; there’s no doubt about that. At the ripe old age of six, the California central coast native began her artistic studies, with Folkorico and tap dance the focus of her early efforts. Later, Ceja moved on to study jazz, contemporary and freestyle hip hop, and, after high school, performed in many large productions at Marian Theater where she also showcased her choreography skills. Along the way, Ceja’s love of music caught the attention of the largest DJ company on the central coast where she was taken under their wing and hired as the company’s first female DJ. Eventually, Ceja hung up her jazz shoes and jumped into drag, taking part in the Los Angeles-based drag troop The Sugar Daddy Show, where she choreographed numbers and played character Buddy B. Long. After the troop’s three-year run, Ceja went on to educate herself at Audiograph International where she studied Audio and Sound Engineering and became the first female at her school to become a Certified ProTools Operator. 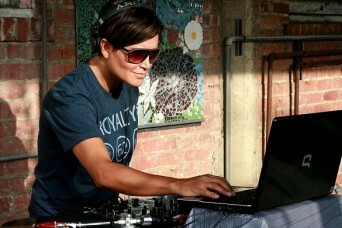 Currently, Ceja can be found mixing it up behind her turntables at Coin OP in San Diego. I was able to get Tina to turn down the volume long enough to shout this week’s Fast 5 questions to her. 1. If you could have one super power, what would you want it to be and why? I would want the super power of flying because I love to travel at high speeds and I never know what’s really going on in an airplane cockpit. “Fall in Love” by Phantogram. 3. What would be your best piece of relationship advice? 4. What’s the last movie you went to the theater to see? 5. If you could be anywhere else in the world right now, where would you want to be and what would you be doing there? Check out some of Ceja’s work on SoundCloud, visit her website and follow her on Facebook and Twitter. Posted May 30th, 2014 & filed under Interviews.